As part of our Scottish anti-bullying roadshow, we were welcomed to Lawthorn Primary School in Irvine by pupils and staff to take part in a discussion with children about this year’s campaign. As November focused around the theme of self-reflection, the children were encouraged to think about their behaviour towards others, as well as the principles of right and wrong when it comes to building positive, respectful relationships. This learning will be built upon over the course of the school year as the campaign reaches the next three stages, ultimately equipping young people with the tools they need to build positive relationships. 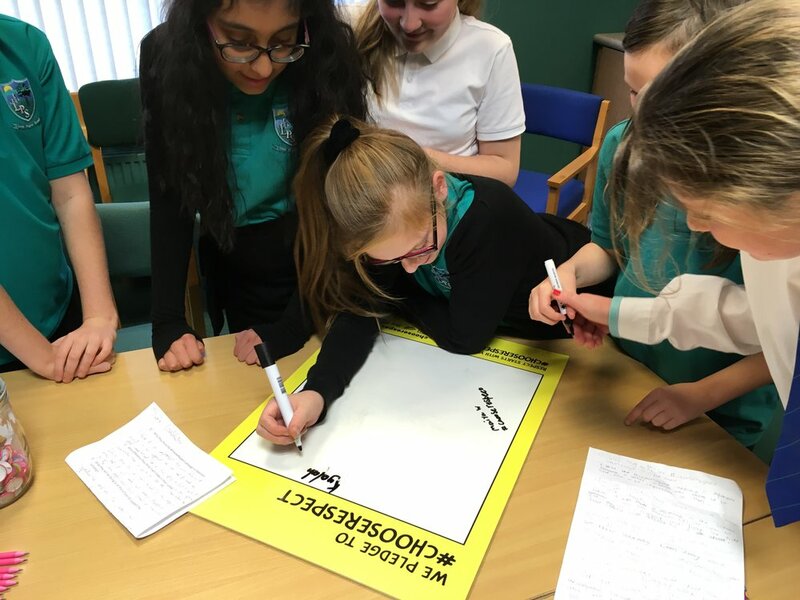 The children really got behind the campaign, and shared their ideas on why respect is important, why we shouldn’t bully and what the #ChooseRespect campaign means to them. Carissa Hyndman, depute head teacher of Lawthorn Primary, said: “At Lawthorn we are fostering positive relationships through respect, inclusion and kindness within our school community. At the heart of this year’s campaign is equipping teachers, youth group leaders and sports coaches with the teaching materials necessary to enable young people to build on their understanding of respect, ultimately encouraging them to foster positive relationships with those around them. As we approach different stages of the campaign, we’ll be releasing new materials that will help spark the conversations that could help change the direction of young people’s lives by proactively helping them to understand the potential impact of the decisions that they make. The campaign would not be successful without the support of schools such as Lawthorn Primary – and it’s fascinating to see how the materials are being used in different settings and how different schools and youth groups are adapting the workshops. Well done to everyone involved. If you’d like to sign up – it’s not too late! You can join the campaign at any stage and we’d be happy to support you on your anti-bullying journey.